What a difference a year makes. Thunder Force 2 was a decent but flawed game with boring overhead levels that were merely tolerated to get to the more enjoyable side-scrolling stags. As a port from the X68000 it was well done but as a game judged on its own merits kind of forgettable. Even taking that into consideration it was still one of the better Genesis launch titles. Thunder Force 3 is such a massive leap forward for the series that it would become the standard that shooters would be measured against on the console. After a string of mediocre titles Arrow Flash and Whip Rush this was a god send. The most profound change is the complete removal of the vertical stages that dragged the series second installment down. They were a good idea in theory but in execution were tedious and dragged on far too long. Most of the frustration these levels presented was due to the removal of the map present in the X68000 version. It’s amazing how much the removal of such a simple feature can impact a game; TF2 would have been far more tolerable if it were present. With Thunder Force 3 Technosoft has succeeded in creating a shmup franchise that is different enough and more importantly good enough to stand alongside Gradius and R-Type. This would be the best Genesis shooter available until they would surpass themselves yet again with Lightening Force. There are less weapons available than in prior installments however the ones that were kept are used far more situationally. By default you’ll always have the twin shot and back shot with the Hunter, Wave, and Lancer serving as additional firepower. The weapon system has been changed to be less punishing in the event of death. Rather than losing all weapons collected upon death only the one currently selected is lost. An additional change that will benefit players are the CLAWS. They’ve been redesigned to function like options in Gradius and collecting just one will arm you with the maximum of two CLAWs rotating around your ship. The initial five levels can be completed in any order and offer up a great deal of variety in environments. Jungle, lava, ice, and underwater may sound like typical video game fare but you’ve more than likely never seen them like this. The Sine wave effect of the lava planet is beautiful but distracting, allowing the sudden columns of fire to catch you unaware. The bubbles underwater will subtly push you upward, an effect that is easy to disregard until it’s too late. 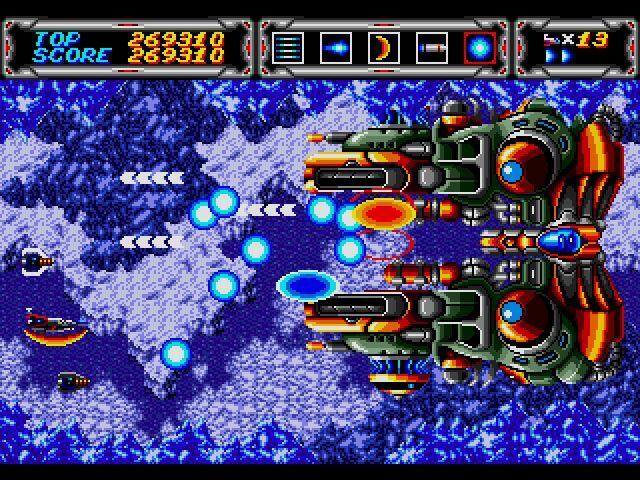 Like Super R-Type the game does a very good job of herding you around the screen into whatever hazards lie in wait, necessitating a much greater focus on the chaos around the screen. You’ll notice that the levels will scroll both diagonally and vertically at times, a small change but one that also brings new challenges with it. There’s a much heavier emphasis placed on stage hazards such as opening and closing gates, sudden shifts in terrain, and other moving parts. You’ll spend just as much time fighting the environment as the enemies themselves at times requiring lightning reflexes. Thunder Force 3 moves fast, and even on the slower planets such as Ellis the enemies can fly in at a moment’s notice. I noticed that the levels are a little shorter than in other shooters but at eight levels this is also longer than most shooters on average. The game’s length does little to shore up the fact that it falls a bit on the easy side. Your weapons are too powerful in comparison to the enemies you’ll face. Standard enemies pose very little challenge; most of your deaths will come from the sudden shifts in terrain that you’ll have very little time to react to. It’s a cheap tactic that is used far too often for my liking, especially since you’ll need to be prescient to see them coming in most cases. Even the bosses outside of two or three will fall within 10 seconds of sustained fire, a far cry from the bullet sponges typical of the genre. The game awards extra lives at regular intervals plus they can be found by scouring every inch of each level. Continues are limited to just five but chances are you will use only one or two before the credits roll. Thunder Force 3 shocked everyone with its graphics and showed just how far the system could be pushed (and would be taken even further in the sequel). The large multi jointed bosses are pretty impressive not just in size but also their design. The judicious amounts of parallax scrolling in the backgrounds created a realistic illusion of depth, especially on the ice planet Ellis. The warping fire background of Gorgon is an effect I don’t think anyone though the system capable of producing and left tongues hanging. For all of the praise the graphics received the soundtrack is just as excellent; it was apparent Technosoft really came into their own working with the hardware with this release. Despite its lacking challenge Thunder Force 3 is still pretty fun to run through every once in a while and still beats the pants off many later shooters for the console like Grindstormer. For a long time every Genesis shooter was measured against this game until the baton was passed to its sequel.